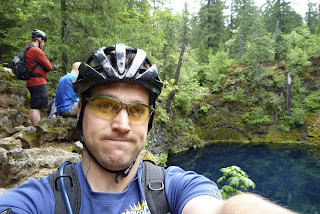 best mountain bike trails in the country, the McKenzie River Trail. The three of us drove up in my Frontier while Tiff and Chris also drove up so we could shuttle cars. That’s the best part of this trail... it’s all downhill following a river. I have done this trail once beforeon mountain bike back in 2006 when I first moved out to Oregon, but then it was raining and miserable, although we did have fall colors. Now it was spring time and dry... or so we hoped. Storm clouds were everywhere and it poured rain over Santiam Pass on our way to Clear Lake, the start of the 25 mile trail. Thankfully, it was still dry at the start of our day long descent. be out on the trail again as she had spent much of the past 9 months in a lab struggling with school and had just defended! Hooray for Tiff! never fell in thankfully. We had left the parking lot at 10:20am and were at my truck at 3:45 so we made pretty good time over the 21.5 miles we biked (see profile below and map on left). I think Boden really had a good time although he was pretty tired afterwards. Emily had a terrific time too but was a little discouraged at not being able to bike as crazy and Tiff, Chris and I but I reminded her that this was just her first bike trip and we had been doing it for nearly 20 years!!! I think she’s going to be fantastic.. although both of us desperately need new full suspension bikes!